The orchid mantis (Hymenopus coronatus) is a flower-like mantis which is largely found in the tropical forests of Southeast Asia. The Hymenopus bicornis is another scientific name for orchid praying mantis. People usually call them by different names precisely due to their uncanny physical appearance. Pink mantis and walking flower mantis are some of the most common names. Orchid mantises typically breed in the Indonesian forests. 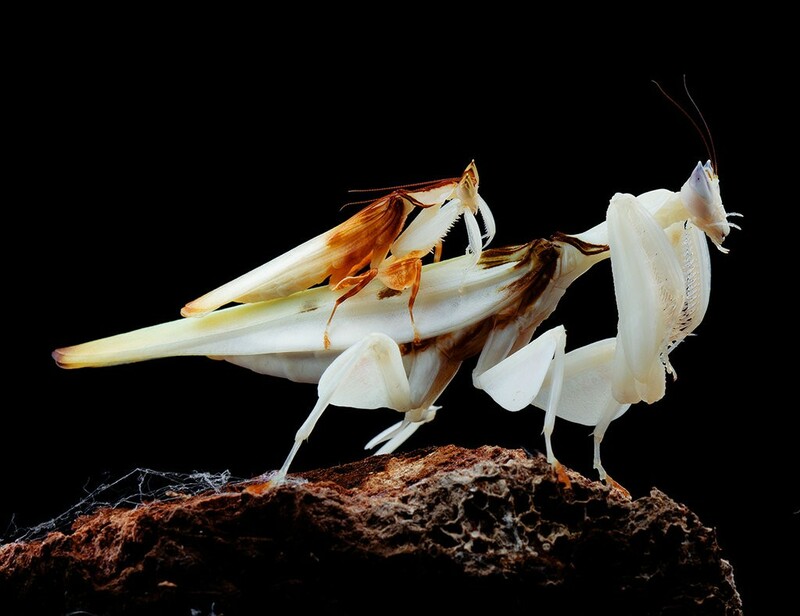 Orchid mantis is one of the few mantises that imitate flowers. But unlike most other mantises, orchid manties are least likely to choose flowers as a successful hunting ground. The reason is simple; orchid mantises become themselves flower, they don’t need to hide in one. 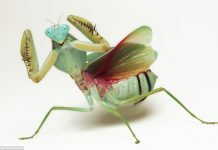 The flower-like appearance of a mantis enables it to inhabit in just about every open field. They preferably seek out patches of green vegetation to tempt their prey. 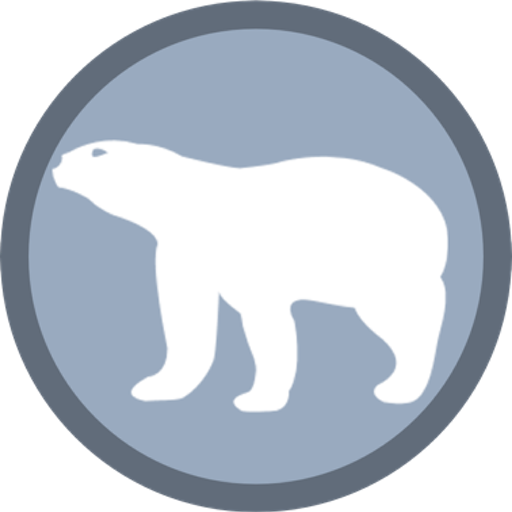 The female can reach the overall length of 4 inches while the male averages around 2 inches. Unlike male, the female displays rich creamy white plumage with some prominent brown patches on it. The orchid mantis is so cryptically colored that it literally looks like a flower. It won’t be wrong to assume that orchid mantises are masters of camouflage. The mantis’ lobes remind us of flower petals. Females are nearly twice the size of males. The nymphs have a strong bite and are disgusting in taste. Pink and brown are the prominent colors of mantis’ body. Orchid mantises predominantly occur in Myanmar, Indonesia, Thailand, and Malaysia. They will make habitats in tropical rainforests. Like all other subspecies, orchid mantis is a carnivore too. The essential items in its diet are insects. The captive specimens like to feed on lepidopteran prey. In the wild orchid mantis can kill prey as large as Dipteran fly. 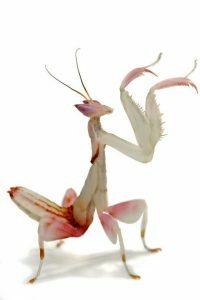 Additionally, the orchid mantis consumes fruit flies, bees, crickets, lizards, turtles, birds, mice, frogs, beetles, and other flies. They can occasionally demonstrate cannibalistic behavior because the male is only half the size of a female. While orchid mantis rarely lingers around the flowers when they starve they do however fancy moving up and down the twigs of the plants. They likely hang on the flower using back legs. 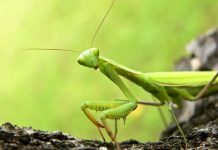 Sometimes mantis will crawl from sideways and stays still just to tempt any bug to feed on nectar. Orchid mantis is most likely to be bred in captivity because it makes a pretty popular pet. 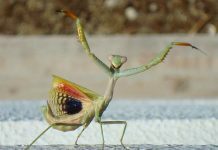 Therefore, we do not know the breeding behavior of the wild mantis. They are truly masters of camouflage. 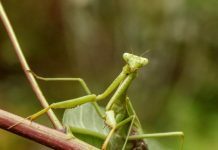 Orchid mantises mimic flowers not only to seek protection from potential predators—they also employ it to capture bigger prey. 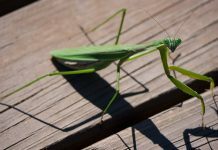 The female mantises have devised ingenious ways to thwart predators. They do not get into the orchid-like flowers. 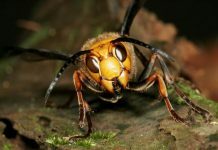 Instead the female will seek out green vegetation and mimic a flower in order to tempt pollinators such as bees, come right to them. Birds and monkeys which are very fond of consuming insects but not flowers pass them by.